Robert Cedric Sherriff, the only child of Herbert Hankin Sherriff, insurance clerk, and his wife, Constance Winder, was born at Hampton Wick on 6th June 1896. He attended Kingston Grammar School and after leaving school in 1914 he joined the Sun Assurance Company in London. A week after the outbreak of the First World War the British Army advertised in the national press inviting young men between the ages of 17 and 30 to serve as officers during the conflict. Sherriff, who was 18 years old in 1914, decided to apply. Sherriff later recalled: "I was excited, enthusiastic. It would be far more interesting to be an officer than a man in the ranks. An officer, I realised, had to be a bit above the others, but I had had a sound education at the grammar school and could speak good English." However, the army was not impressed with his grammar school education and his application was rejected. Sherriff returned to his job with the Sun Assurance Company. However, by the following year, the British Army had lost so many junior officers that it decided to lower its standards. In November 1915, Sherriff volunteered again and he was granted a commission in the East Surrey Regiment. He arrived on the front-line of the Western Front on 7th October 1916. Over the next four months he served at Vimy Ridge and Messines Ridge. On 27th January 1917 Sherriff was wounded during a bombardment at Bracquemont. 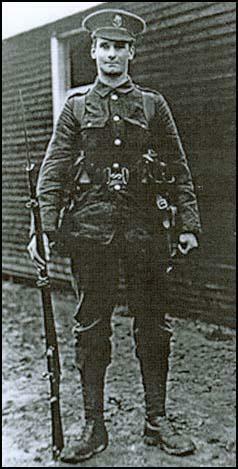 After two weeks of being treated at the 73rd Field Ambulance's Main Dressing Station he returned to the front-line. In July he was sent on a sniping course at Mont des Cats. General Sir Douglas Haig, the British Commander in Chief in France, was encouraged by the gains made at the offensive at Messines Ridge. Haig was convinced that the German Army was now close to collapse and once again made plans for a major offensive to obtain the necessary breakthrough at Passchendaele. Sherriff and the East Surrey Regiment took part in the opening sequences of the battle. 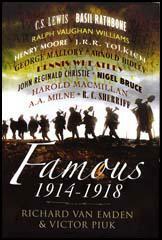 In his autobiography, No Leading Lady (1968), Sherriff recalled: "The great preliminary bombardment had begun. We were surrounded by batteries of artillery, and for three nights it was bedlam." Sherriff argued in No Leading Lady (1968): The living conditions in our camp were sordid beyond belief. The cookhouse was flooded, and most of the food was uneatable. There was nothing but sodden biscuits and cold stew. The cooks tried to supply bacon for breakfast, but the men complained that it smelled like dead men." On 31st July 1917, Sherriff and his men were called forward to attack the German positions. "At dawn on the morning of the attack, the battalion assembled in the mud outside the huts. I lined up my platoon and went through the necessary inspection. Some of the men looked terribly ill: grey, worn faces in the dawn, unshaved and dirty because there was no clean water. I saw the characteristic shrugging of their shoulders that I knew so well. They hadn't had their clothes off for weeks, and their shirts were full of lice." Sherriff later recalled: "All of us, I knew, had one despairing hope in mind: that we should be lucky enough to be wounded, not fatally, but severely enough to take us out of this loathsome ordeal and get us home. But when we looked across that awful slough ahead of us, even the thought of a wound was best forgotten. If you were badly hit, unable to move, what hope was there of being carried out of it? The stretcher bearers were valiant men, but there were far too few of them." As the battalion advanced towards the German front-line a shell exploded close-by: "The crash was deafening... I remember putting my hand to the right side of my face and feeling nothing; to my horror I thought that the whole side had been blown away." In fact, the shell had landed on the top of a pillbox and he had been hit by the shattered concrete. Sherriff was taken to the Casualty Clearing Station at Abeele. He was one of the 2,015 men treated in the opening two days of the offensive. He was later moved to the 14th Base Hospital at Wimereux. He later recalled that "with the aid of probes and tweezers, a doctor took fifty-two pieces of concrete out of me." Sherriff was sent back to England and remained at Royal Victoria Hospital at Netley until November 1917. He then joined the Home Service battation of the regiment until being demobbed in March 1919. He returned to working as an insurance adjuster. In his spare-time he wrote plays for the annual fund-raising event at his Kingston Rowing Club. His first play was The Adventurers. Sherriff's next play was Journey's End. It had been turned down by most of the theatres in London and only appeared after the intervention of George Bernard Shaw. 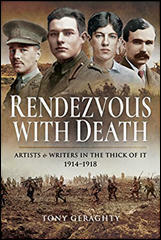 As his biographer, John Courtenay Trewin, points out: “Journey's End, a play based upon his letters home from the trenches, in the new year of 1929 he became one of the most discussed English dramatists of the day…. The play is set entirely in a claustrophobic dugout before St Quentin on the eve of the March offensive of 1918. Sherriff, who always favoured naturalism in theatre, had sought to give no more than a straight, simple impression of the terrors of the western front in a play written with so much honesty - no heroics, no pretence - that its characters stamped themselves upon the English theatre of their time.” The play, with Laurence Oliver, playing the lead role of Captain Dennis Stanhope, was a great success and there were 594 performances in London and 485 in New York City. It was also translated and performed in every European language. A film version of Journey's End appeared in 1930. Sherriff's next two plays, Badger's Green (1930) and Windfall (1933), were not successful. Sherriff decided to study history at New College, Oxford in 1931. After completing his degree he moved to Hollywood to work on film scripts. This included The Invisible Man (1933), One More River (1934), The Road Back (1937), The Four Feathers (1939) and Goodbye, Mr. Chips (1939), a film for which he won an Academy Award. Other film scripts written by Sherriff include That Hamilton Woman (1941), This Above All (1942), Forever and a Day (1943), Odd Man Out (1947), Quartet (1948), No Highway (1951), Storm Over the Nile (1955) and The Dam Busters (1955). His autobiography, No Leading Lady, was published in 1968. According to John Courtenay Trewin: "Sherriff, who never married, was devoted to his mother. Lacking self-confidence, he preferred the company of people younger than himself. He was an endearingly kind and gentle man, qualities evident in his memoir, No Leading Lady (1968). He spent much of his life, after his early success, at his home, Rosebriars, Esher Park Avenue, Esher, Surrey, later adding to this a farm in Dorset." Robert Sherriff died in Kingston Hospital, London, on 13th November, 1975. The images on this page are courtesy of Kingston Grammar School & Surrey History Centre. I was excited, enthusiastic. It would be far more interesting to be an officer than a man in the ranks. An officer, I realised, had to be a bit above the others, but I had had a sound education at the grammar school and could speak good English. I had had some experience of responsibility. I had been Captain of games at school. I was fit and strong. I was surely one of the "suitable young men" they were calling for. Some of their feet were horrible to look at: raw skin and bleeding blisters and big, angry sores. Their army boots rarely fitted comfortably. They were made in a few standard sizes, and a man was lucky if he got a pair that was neither too big nor too small. To march all day in them with blistered feet must have been a torment... The men marched like beasts of burden with heavy packs on their backs, rifles and bandoliers of ammunition slung across their shoulders. Sometimes they would break into a marching song to ease the misery, but now and then, as I marched at the head of my platoon, I would hear a clatter behind me and turn to see a man lying prostrate in the road. The sergeants were instructed to prod them and order them to get up. There was always the possibility that the man had decided that he had taken as much as he could bear and had staged his collapse to get out of it. But most of them were genuine - down and out. Our battalion was holding some trenches at the southern end of the British line when one night, without warning, we were replaced by another battalion and marched back to a village a few miles behind. This in itself was ominous. If they took you out for a rest, it usually meant that you were for it in the near future. The great preliminary bombardment had begun. We were surrounded by batteries of artillery, and for three nights it was bedlam. It had now begun to rain.. .Living conditions in our camp were sordid beyond belief. The cookhouse was flooded, and most of the food was uneatable. There was nothing but sodden biscuits and cold stew. The cooks tried to supply bacon for breakfast, but the men complained that it "smelled like dead men". At dawn on the morning of the attack, the battalion assembled in the mud outside the huts. I lined up my platoon and went through the necessary inspection. Some of the men looked terribly ill: grey, worn faces in the dawn, unshaved and dirty because there was no clean water. I saw the characteristic shrugging of their shoulders that I knew so well. They hadn't had their clothes off for weeks, and their shirts were full of lice. Our progress to the battle area was slow and difficult. We had to move forward in single file along the duckboard tracks that were loose and slimy. If you slipped off, you went up to your knees in mud. The order came to advance. There was no dramatic leap out of the trenches. The sandbags on the parapet were so slimy with rain and rotten with age that they fell apart when you tried to grip them. You had to crawl out through a slough of mud. Some of the older men, less athletic than the others, had to be heaved out bodily. In the old German trench we came upon a long line of men, some lolling on the fire step, some sprawled on the ground, some standing upright, leaning against the trench wall. They were British soldiers - all dead or dying. Their medical officer had set up a first-aid station here, and these wounded men had crawled to the trench for his help. But the doctor and his orderlies had been killed by a shell that had wrecked his station, and the wounded men could only sit or lie there and die. There was no conceivable hope of carrying them away. We came at last to some of the survivors of the first wave. They had reached what had once been the German support line, still short of their objective. An officer said, "I've got about fifteen men here. I started with a hundred. I don't know where the Germans are." He pointed vaguely out across the land ahead. "They're somewhere out there. They've got machine guns, and you can see those masses of unbroken barbed wire. It's useless to go on. The best you can do is to bring your men in and hold the line with us." We were completely isolated. The only communication with the rear was to scribble messages in notebooks and give them to orderlies to take back. But the orderlies wouldn't have the faintest idea where the nearest command post was, even if they survived. It came to an end for me sometime that afternoon. For an hour or more we waited in that old German trench. Sometimes a burst of machine-gun bullets whistles overhead, as if the Germans were saying, "Come on if you dare". Our company commander had made his headquarters under a few sheets of twisted corrugated iron. We heard the thin whistle of its approach, rising to a shriek. It landed on top of a concrete pillbox that we were passing, barely five yards away. A few yards further, and it would have been the end of us. The crash was deafening. My runner let out a yell of pain. I didn't yell so far as I know because I was half-stunned. I remember putting my hand to the right side of my face and feeling nothing; to my horror I thought that the whole side had been blown away. How badly we were wounded we didn't know. We were covered with blood and mud. All that mattered was that we were still on our feet, with our wits about us, and we stumbled back the way we had come. The company commander took one look at us and said, "Get back as best you can, and find a dressing station". We began the long trek back, floundering through the mud, through the stench and black smoke of the coalboxes (howitzer shells) that were still coming over. Here and there were other walking wounded, mainly in pairs, supporting themselves pitifully with arms around each other's shoulders. Many were so badly wounded that they could barely drag themselves along, but to save themselves was their only hope. There was no one else to save them. How many survived I don't know. We saw some fall and lie prostrate in the mud. We could only hope that they went on again when they had rested. It seemed hours before we reached a dressing station, then only by a lucky chance. It was a ramshackle tin shelter amid a dump of sandbags that once had been a gun emplacement. The doctor was treating anybody who managed to find his way there. A lot of men were lying around, and some stretcher-bearers were sorting out the living from the dead. The doctor swabbed the wounds on our hands and faces and tried to see through the holes in our uniforms where pieces had gone in. "You don't seem to have got anything very deep," he said. "Can you go on?"